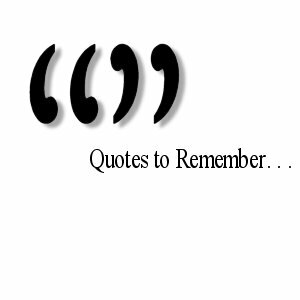 I'm going to be away from the blog for a few days, so I'm following the lead of my friend Jason Lauritsen and am offering a few of my favorite quotes. How about we each find one that means something to us and then do something about it? "Leadership is a combination of strategy and character. If you must be without one, be without strategy." person's character, give them power." Nice idea Jay and Jason. Great stuff Doug! All the credit goes to Jason...I'm just chasing his coat tails.